I’m delighted to announce my new single is now available!!! It’s called ‘Our New Horizon’ and was originally written about the state of the economy, the country … and much of the world really. It’s about taking a stand against the powers that be and maintaining one’s dignity and self belief. United we stand, divided we fall. But recently the lyrics have become more meaningful to me on a personal level and so it feels appropriate to release this as the first single from the next album (yet to be christened! Still looking for inspiration!) It’s release today sees the sun beating down outside. Spring is really taking a wee break and allowing us a sneak preview of Summer! Teasing us with thoughts of long, warm, sunny days! It all feels very good and positive. Light. Glorious light. You can purchase the single here (Ireland) and here (UK). So much love and appreciation to everyone who has sent me messages and been so supportive in the last few days … thank you, thank you, thank you! I am absolutely blown away by the good vibes and positivity coming my way … they say everything that happens, happens for a reason … and boy, does that seem true! This overwhelming warmth is breathtaking. I will keep you posted on what I’m doing. Onwards and upwards!!! Calling all musicians! Here is your exclusive chance to win a fully produced music video complete with the latest CGI effects, incredible animation, a fantastic team of actors, dancers and your very own production crew. To enter this fantastic competition simply collaborate with other artists on Emeraz.com …Yes, that’s it – it’s that simple….And, it’s FREE. I am one of the judges for this competition and I’ll help select five finalists who will then be profiled in a special double page spread in Hot Press magazine and on national radio. From these finalists the winner will then be chosen by popular vote. The 5 finalists will be introduced in the Hot Press special on the 18th of November 2010. I will be keeping a keen eye on your uploads and will be lending some words of wisdom as your songs develop! You can find out more at Emeraz.com and if you do decide to enter, good luck! Do you believe that the arts are fundamental to Ireland’s social and economic wellbeing? I do! My friend Peter Daly is doing tremendous work for the arts, so I want to help spread the message about his national campaign for the arts here on my site. You can watch the video below and check out www.ncfa.ie for more information. It’s been a while since I checked in, so here’s a little update on what I’ve been up to. Just back from Guernsey where I was doing the show ‘Seven Deadly Sins, Four Sinners‘ at The Beau Sejour Theatre. I did this show last year in Barbados with Sue Holderness (â€˜Maryleneâ€™ in Only Fools & Horses), Sarah Crowe (â€˜Lauraâ€™ Four Weddings & A Funeral) and Belinda Lang (â€˜Billâ€™ 2.4 Children) and this time Belinda and I were joined by Eva Pope (â€˜Tanya Pooleyâ€™ Coronation Street / â€˜Rachel Masonâ€™ Waterloo Road) and Tracey Childs (â€˜Lindaâ€™ Born & Raised). It was so lovely to meet these wonderful ladies. We had a lot of fun. We had some time to see a bit of Guernsey – a really interesting and beautiful place – and luckily Karen was on hand to be tour guide and hostess extraordinaire. And we four and our director Marc Sinden managed to pop in for a chat with Jim Cathcart at BBC Guernsey. 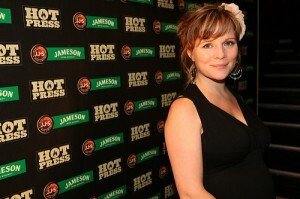 Last week I was invited to attend the launch of the Hotpress yearbook. I joined friends like Sharon Corr, Billy Farrell, Keith Duffy and many others for a wonderful evening. You can read all about the event on the Hotpress website and see lots more pictures of all of us at the event here, here and on my Facebook page! Average Rating: 4.4 out of 5 based on 287 user reviews. I’m back in studio in London this week recording with Davey MacManus for his new album. After spending the last few months rehearsing and acting it’s great to be back in studio again. I’m really looking forward to doing some of my own music soon too.